The development includes a new 117-bedroom hotel and the redevelopment of the Royal Irish Automobile Club’s private members’ club. 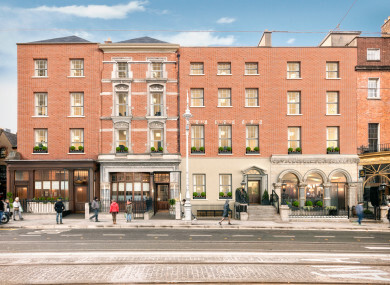 PLANS HAVE BEEN lodged for a €35m development that includes a new 117-bedroom hotel and the redevelopment of the Royal Irish Automobile Club’s private members’ club on Dublin’s Dawson Street. The firm making the application with Dublin City Council, Miro Hotel 2 Limited is an investment company connected to the owner of the Marker Hotel in Dublin and five-star Powerscourt hotel in Co Wicklow, Tetrarch Capital. The application is being made after Miro Hotel 2 Ltd purchased the Dawson hotel on Nos 35-36 Dawson Street & Anne’s Lane. Now together with the RIAC, located on the adjoining site, on Nos 33-34 Dawson Street, both parties are to co-develop both sites to reconfigure the HQ of the RIAC and to create the 117 bedroom hotel. Established in 1901, the RIAC is a private members’ club and the club currently provides two restaurants, a bar and a members’ reading room along with a substantial library. The site is located opposite the Mansion House on Dublin’s Dawson Street and the proposal for the RIAC property follows extensive research into potential options for the redevelopment and refurbishment of the RIAC’s buildings. The redevelopment is intended to guarantee the long-term future of the Club and deliver sustainable, best-in-class facilities for all members of the RIAC. It is envisaged that the RIAC will vacate the club by the end of June 2019 and that the redevelopment works would be completed within 24 months. The challenge for the architects, McCauley Daye O’Connell in the scheme was to create a high-quality contemporary hotel which will be branded using the site’s heritage as an inspiration and sensitively reconfigure and enhance the existing RIAC HQ to create a quality design for the 21st century which respects its heritage. The facilities will include a new members’ restaurant, bar, reading room, meeting rooms, offices for the RIAC and Motorsport Ireland and a new location for the Club’s Guinness Seagrave Library. In the new hotel, the heritage of the RIAC will inspire the interior design throughout the redevelopment, which will incorporate distinctive and classic images, materials, colours and memorabilia from the automobile world. A new glazed atrium will house a central courtyard lobby and shared reception for the new Club and hotel, linking the key areas of each facility with lift access to be provided to all areas of the proposed development. “We have worked diligently to create a scheme that will respect the original character of the site while delivering a stunning design and revitalised set of modern facilities for Club members and hotel guests”. Email “€35m hotel planned for Dublin's Dawson Street”. Feedback on “€35m hotel planned for Dublin's Dawson Street”.